In a bid to have a banking environment with fewer but healthier lenders, India witnessed its first ever merger of 3 public sector banks. In a first of its kind public sector merger in India, two smaller Public Sector Banks (PSBs), Vijaya Bank and Dena Bank merged into Bank of Baroda. The three-way fusion aims to create a healthier entity, which overtakes ICICI Bank to become the third largest lender in the country (after SBI and HDFC Bank). The new entity is envisioned to be a globally competitive banking institution – a bank which is able to offer a wider portfolio of products and services with better resources. Existing Dena Bank and Vijaya Bank network reach will enable BoB to cover western, southern and north-eastern regions. This gives the combined entity a greater market reach, better operational efficiency and a bigger customer base. The new formed mega bank will have a total business of about ₹15 trillion. The customers will continue with the same account numbers, IFSC Code, MICR Code along with their current cheque books and ATM cards. Interest rates on loans and fixed deposits are expected to remain the same. All Dena and Vijaya Bank branches are now under the BoB banner. This means BoB overtakes debt-ridden Punjab National Bank to emerge as the second largest PSB. With mammoth numbers, the entity now holds 9,490 branches, 13,400 ATMs with 85,678 employees serving 12 Crore customers. The three-way merger results in a combined business of Rs. 14,82,422 Crore, deposits of Rs. 8.75 Lakh Crore and advances of Rs. 6.25 Lakh Crore. Infusion of Rs. 5,042 Crore from the government by way of preferential allotment of equity shares, will help strengthen the balance sheet of the merged entity and meet its credit and contingency needs. As per reports, the backend technology integration is expected to be smooth, with all three banks running on the same Finacle CBS platform. However, Markets feel the overall cultural integration of the three banks might have an impact of the new bank’s near-term performance. On the ground, some branches of the banks are expected to be shut down to reach economies of scale and remove overlapping. The merger is part of the government’s strategy to tackle the recent spurt in bad loans (NPAs) which has turned several high-profile banks in to debt-ridden entities. Finance Minister Arun Jaitley has, on multiple occasions, emphasized on the need to have stronger consolidated banks. 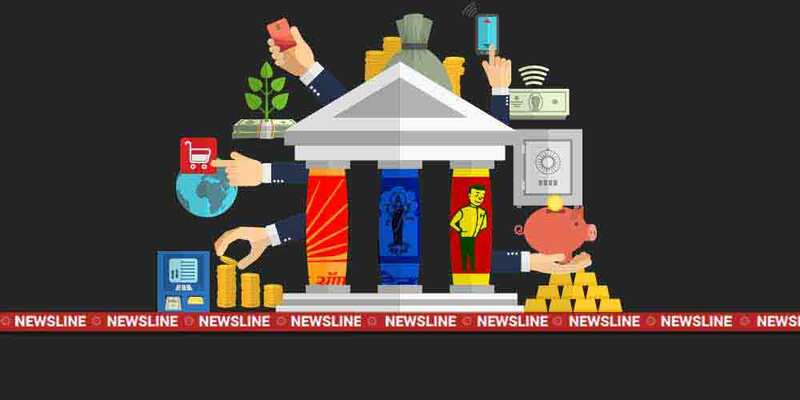 Being the majority shareholder in 21 banks (accounting for more than two-thirds of the banking assets in India), the government has been analysing various models of PSB consolidation. The seeds of the grand merger were sown after the successful first such experiment of the government with SBI. On the same date two years ago, SBI took in five associate banks (SBBJ, SBH, SBT, SBP and SBM) and Bhartiya Mahila Bank. That move propelled SBI among top 50 banks in the world, with its post-merger numbers stood at 37 crores customers, 24,000 network branches and 59,000 ATMs. The success of the SBI experiment gave government the confidence to layout a plan to reduce the number of PSBs from the existing 21 to 12, and in the process create 3 to 4 global sized banks, as per the 3-tier structure. The BoB merger brings down the number of PSBs to 19. A few days before the merger, Supreme Court rejected petitions seeking to stay the move. The scepticism emerges from the poor performance of one of the trios i.e. Dena Bank. The institution has one of the industry’s highest gross NPA ratio. RBI had barred Dena Bank from lending any further or recruiting new employees back in May 2018. The merger saves Dena Bank which is under RBI’s Prompt Corrective Action (PCA) framework for burgeoning losses and NPAs. 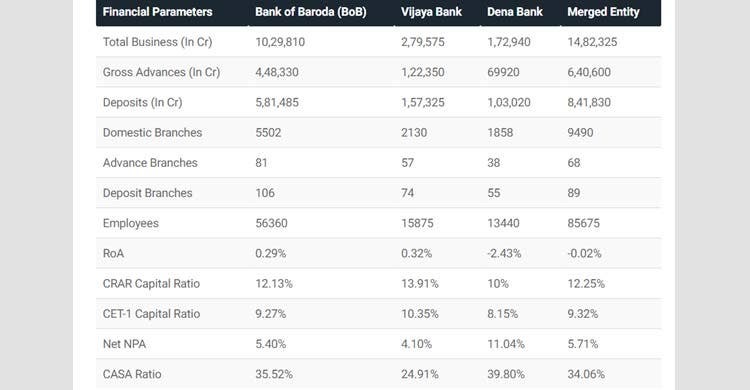 However, Dena Bank’s bad assets will definitely bring down the mood of BoB and Vijaya Bank stakeholders. But the market perception was positive as Bank of Baroda shares gained 3 per cent after the merger. As per Moody’s report, BoB’s profitability is predicted to be ‘pegged down’ by the NPAs of the other two banks. Finance Ministry had assured the concerned, that two stronger banks will be able to absorb the weaker entity. A number of other struggling PSBs are slated for the same fate. As per the Merger List, PNB will acquire OBC, Allahabad Bank, Corporation Bank, and Indian Bank. Bank of India will take Andhra Bank and Bank of Maharashtra under its umbrella, Canara Bank will take up UCO Bank, Syndicate Bank, and Indian Overseas Bank; and Union Bank of India will merge with IDBI, and Central Bank of India. Is it a wise step? With extensive consolidations, the government expects to crack down on private business practice of forfeiting loans to smaller banks. The larger combined banks will in turn get a larger distribution channel for themselves, adding to the operational strength and health of the PSU. While the government foresees a vision wherein the Indian economy’s reigns lie in its hands with three to four world class banks taking care of the country’s development. How old NPAs and deficits will influence the health of the new bank moving forward will be crucial to the success of the grand merger scheme. But high hopes are expected from the further expansion of the young and promising Bank of Baroda to strengthen India’s banking system.